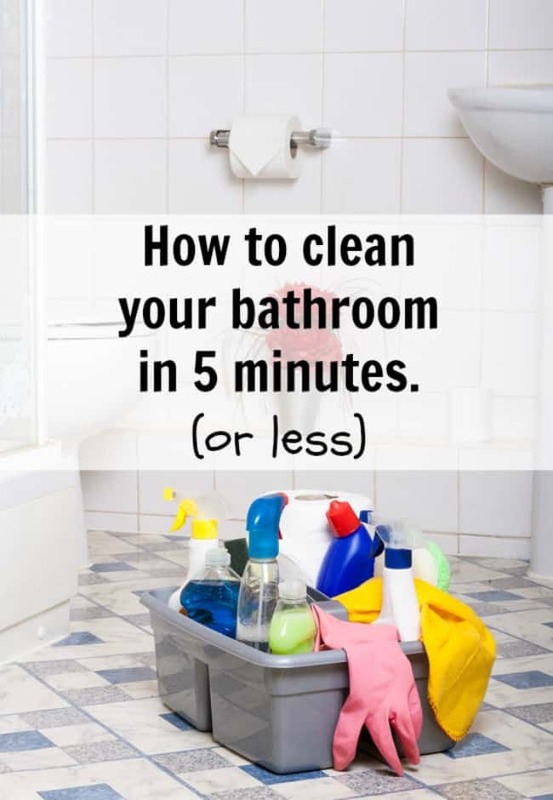 Quick Bathroom Cleaning Tips - Clean in 5 minutes or less! These quick bathroom cleaning tips will get your bathroom clean in 5 minutes or less. Hate cleaning your bathroom? These tips will help you speed up the chore and get you back to doing something fun in no time. Quick bathroom cleaning tips to clean in 5 speedy minutes! The other day I was just sharing with you how to speed clean your home before company arrives. Well, as I mentioned one of the best things to do is keeping your home tidy as possible on a daily basis. I can share with you more tips on how I tidy my entire home later but today I wanted to share with you how to keep your bathroom tidy every day. All you really need is a quick 5 minutes. Yep… Just 5! You can even time yourself. 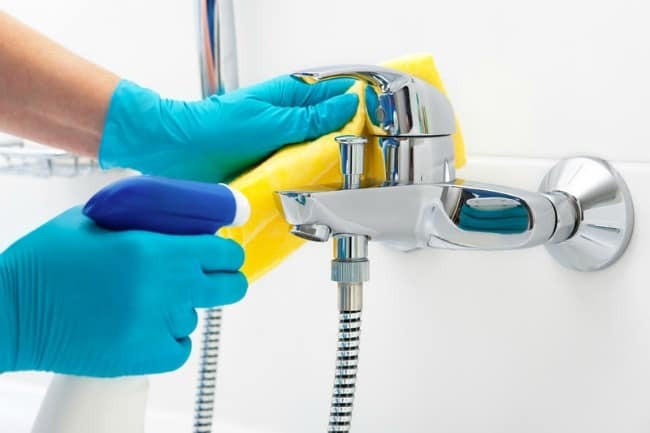 Cleaning bathrooms are probably one of the biggest time-consuming jobs when it comes to cleaning our house. Without even asking I can guarantee that the bathroom is the least favorite room in the house to clean for the vast majority of you. Me too! There are just so many spots that can get messy, like the tub and the toilet. For me, though, the toilet is a no brainer. Pop in 2000 Flushes tablet and we are golden for probably about 4 months, just a little swish with the toilet brush and call it good. 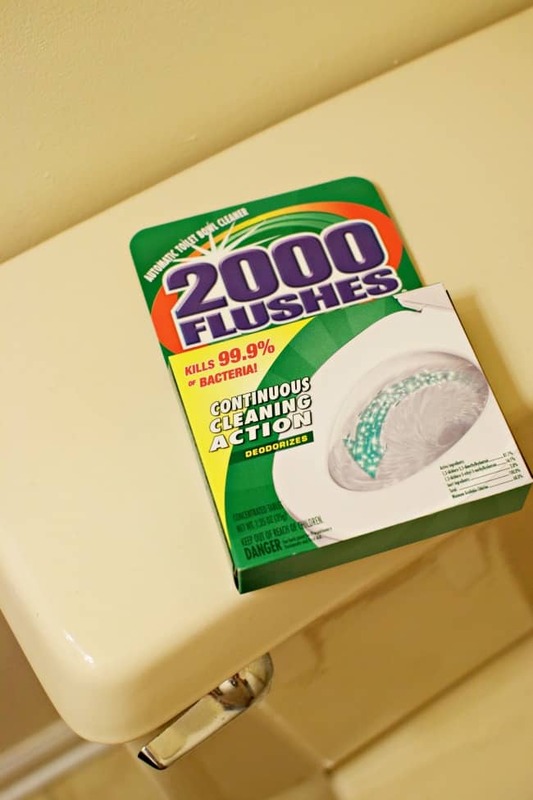 Pop in a new 2000 Flushes tablet when needed. All that really needs to be done in that department on a daily basis is a little bit of wiping up around the edges. I wished I could say the same for the tub. Unfortunately, I just can’t pop a tablet that keeps it clean. However, I like to spray on a cleaner and let it do its magic while I spend the other 4 and a half minutes cleaning everything else up. Once the shower cleaner is doing its thing I spend time cleaning off the counter of everything that needs to be put away and do a quick wipe down. You don’t want to miss the mirrors. Clean those up too! The last step is turning on the shower and letting the cleaner wash away. Pick up any trash and dirty laundry as you walk out the door and call it done. If you do this daily it never becomes a 30 minute or more chore to clean up your bathroom. The same rule applies to your entire house. The above quick bathroom cleaning tips can help you clean not only fast but efficiently. Here are a few extra tips to help you down the road as well. Put away makeup, toothpaste, medicine, etc right after using them. It makes for counter clean up a breeze. Do you make a mess while brushing your teeth? Use your hand and clean the sink of any excess toothpaste or soap. This same concept can work in the shower. Take dirty laundry with you every morning and place it in the laundry room. Little daily chores keep from big weekend cleaning sprees. Who really wants to do that or has time to do that. Speed Clean your Home in no time! Small kitchen upgrade with a big design impact!